I have been working on dad's 68 American again. I have run across an odd couple of situations, and am looking for input from people more versed on AMC than I. When started, it is silent. Life is good. As it warms up, it develops a ticking sound. Similar to a lifter tick, but not exactly. Shut it off for a minute, start it up.... same thing, silent for a minute, than makes noise again. When it shuts off, I can hear oil draining back down into the crankcase. So, I thought I had good oil flow. I am not familiar with the 199, so I pulled the valve cover to see how the rocker system was set up. Found that they are on a shaft, so no real adjustment. Decided to start it with no valve cover.... Expected at least some oil splashing, but there was none. Shouldn't there be some coming through the push-rods to lube the valvetrain? Also, at this point things were sounding the same.... until there was a loud clunking sound. Happened maybe 3-4 times in a row. Shut it off thinking the bottom end was about to get a new kitchen window. Put the valve cover back on, started it up, silence for several seconds, then the ticking returned. I have had a stethoscope on everything, and cannot find the noise that way. The only noise transfer I am getting is through vacuum pump on top of the new fuel pump. 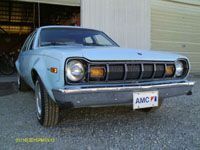 I know this is long winded, but I want to give the AMC guru's here as much info as I can. The head bolt mod might fix it but on my donor engine it had been tried before. As I recall the oil path is around the outside of a cam bearing before it comes up through the head and then through a rocker shaft pedestal. On my engine that groove around the cam bearing wasn't cut deep enough and I ended up putting in an overhead oiler line through the side of the valve cover and into the pedestal. If you remove the distributor you can turn the oil pump with a long screw driver or bit and drill to see if oil is getting to the top. Once you get it fixed it is easy to check for flow by removing the oil cap and looking for oil at the front rockers. I will be doing the bolt mod for sure. Thanks for that info. Now, I am guessing you have to have the bolt machined all the way around, and not just "flatten" one side of it? Either way, nothing a little time with a grinder and a wire wheel can't take care of. Once again, thanks for pointing me in a good direction on this problem!! If your rockers and shaft need replacing there is also the option of putting a head from a 4.0 L on it. I have not done that yet but others here on the forum have. #1: those earliest heads delivered oil to the top by excess clearance around one of the #4 cyl head bolts. there's a fix that's just grinding the shank of the bolt thinner to make more clearance, and digging as much crud out of the hole as you can with a peice of stiff wire. switching to a new head is completely unnecessary to solve a minor oiling problem. and if the lack of oil has caused excess wear, a straightforward cylinder head rebuild will solve it permanently. also swapping any major part is rarely a simple drop-in; all sort of minor stuff will have to be accommodated. #2: HA! i think you will appreciate this... your sporadic ticking is the FUEL PUMP and it's perfectly normal. you can only hear it on quiet engines! here's how it works: the camshaft's fuel pump eccentric lifts and lowers the lever in the fuel pump. when the pump is moving a large-ish amount of gas, the lever works the diaphragm which moves the fuel, and the lever follows the eccentric. but when little fuel is moving, eg. the carb bowl is full (as it is only a few seconds after startup) and the engine's idling (using nearly no fuel) the pump diaphragm doesn't lower back down onto the lever, so the lever is no longer riding on the eccentric -- it's a bit above it, so as the eccentric comes around again and again it slaps the tip of the lever and makes that scary ticking noise. OK, with it ticking at idle, with your head under the hood rev the engine up a couple times, to use up a bit of fuel in the carb bowl. if you listen carefully, the ticking will be much reduced for a second, then return, as the pump pushes fuel into the carb. once it's full, it ticks. I just mentioned the 4.0 L head swap so all options are on the table. Let us know how that head bolt mod goes. The engine I have that had a lot of problems came from a 67 American. I have a worn and clacking rocker set that got that way from it having been run without oil. The shaft is hard and I tried drilling through to be able to flip it over but even cobalt bits wouldn't do it. For parts try Galvin's. I am NOT disagreeing with you, but this seems mighty loud to be that. You could very well be right, the noise level is around weak/collapsed lifter level. Now lets say the pump is indeed the culprit, I am assuming I am just stuck with the noise? I did notice the pumps have a brass(?) contact that slides on the pump arm. I didn't give it any thought at the time but maybe that is what causes the noise when the carb is full as you mentioned? It will be a couple weeks before I get back on it again (rotating swing shift) but I will be keeping everyone posted on how things go. well of course i can only guess from this great distance. compression and/or leakdown tests and the squirt of oil to check rings will reveal more. if its loud i'd too suspect stuck lifter etc. maybe i read more into 'quiet engine' etc. vinny points out too that if it was driving long without topend oil lifter stuff could be badly worn. that's easy enough to take off, to pieces, examine lube and possibly replace. you can examine pushrod tips, roll the pushrods on something very flat (window glass or mirror) to check for bends, rocker fit on the shaft, gouging, etc. since the lifters are self-adjusting you can take it off and just put it back on. the torque spec is modest. you can get good used or new rocker shafts for thr 199/232 i think (as vinny sez) if it comes to that. still lots of parts available for that motor!